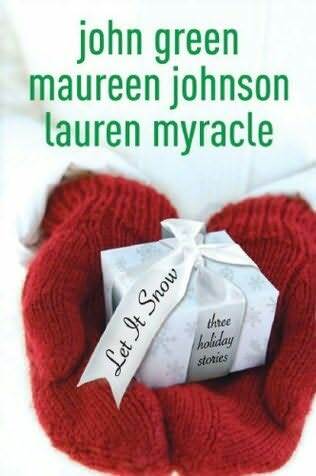 Summary: Three romances unfold in the wake of an enormous blizzard on Christmas Eve. Divided into three sections, though they all intertwine in some way, this book shows us the story of Jubilee finding new love and discarding old that wasn’t working out, Tobin finally making his move on a girl he thought was just his friend, and…some crazy chick with pink hair doing something with a small pig. Ok. I’m aware how seasonally inappropriate it is to be reviewing this book right now with spring coming so soon. Rita’s is open, Cassie-wa’s in her flipflops already, and we’re panicking hoping new tattoos will be healed by beach time. But I don’t have time to read a new book a week and I love this book so – deal with it. I’m generally not a fan of romance and especially not YA romance because it’s usually silly or involves sparkly vampires. When I first got this book I didn’t realize the stories were connected so had skipped to the second story to read John’s first. At the time I was aware of Maureen’s existence through John and Hank, but I had not read anything by her and of course she was not at the time the queen of twitter that she is now. I quickly realized my mistake and backtracked to Maureen’s story. Immediately I could tell she was just as brilliant of a writer as John – writing about smart teens who do not fight demons and yet I find myself drawn to them and their lives anyway. Maureen’s story is about a girl named Jubilee – self-confessed that it sounds like a stripper name. Her parents are obsessed with collecting “Flobie Santa Village” pieces and she’s named after Jubilee Hall. She generally tells people that her name is Julie so she doesn’t have to hear it. Her boyfriend of one year exactly on Christmas Eve is Noah – king of the school in academics, president of the student council, all around hot guy…. She feels so lucky to have him even though he’s endlessly busy. She’s excited to see him for his family’s annual Smorgasbord when disaster strikes – her parents get arrested at a riot started over people waiting in line for limited edition Flobie pieces. She gets on a train to get shipped off to her grandparents, a blizzard strikes, and she ends up stranded at a Waffle House with a ton of cheerleaders who are all named Amber or Madison. But then she meets Stuart – a stranger covered with Target bags who takes her home for Christmas…. Really it’s the weird details I would expect from Maureen that make this story so great. I love how all the cheerleaders become a mass of annoying, I love that Stuart is covered in Target bags to protect himself from the blizzard, I love that Stuart’s mom is Jewish but loves Christmas traditions anyway. I love that when Jubilee calls Noah he says he can’t talk because he’s carrying an enormous ham. I laughed all the way through this at the little things like that. The tone is perfect. Gradually as Jubilee’s situation becomes worse and worse it becomes more and more obvious that Noah doesn’t really care much about her, just about having a girlfriend to present at social events. But in the end we learn a heartwarming lesson – that you can be stranded in a blizzard, go home with a stranger, fall in love, and change your life through the magic of Christmas. Love it. John’s story is equally hilarious – his characters are so smart, so snarky, so quick with the hilarious things they say. And after reading this, I always think of John whenever I hear someone say “asshat.” In this story, Tobin, JP, and the Duke (who is actually a girl) are celebrating the blizzard with a James Bond marathon when suddenly their friend Don Keun calls screaming that the Waffle House he works at is full of hot cheerleaders who MUST play Twister. The other employees are calling their friends next and the Waffle House will only accept one group – first group to get there with Twister gets the previously mentioned Ambers and Madisons that Jubilee was so grateful to escape. Everything has to move fast and a crazy, fast-paced race takes place through feet of snow, despite crashing their car into a snowbank, almost getting frostbite, and almost getting their asses kicked by twin asshats. The boys knee-jerk reaction to finding out about a Waffle House full of cheerleaders is that they MUST get there IMMEDIATELY because clearly that is AWESOME. However, as their adventure unfolds Tobin realizes that the goal actually isn’t that important – it’s the adventure part, the stuff that happens before they complete the journey that’s crazy and fun and worth remembering. He also realizes that his dear friend the group IS a girl, that she likes him, he likes her…and it is just adorable. Love. Love. Love. Lauren Myracle. What can I say about this third story… Well. She doesn’t quite live up to the greatness that Maureen and John set up for her. The main character in her story is a really annoying girl named Addie who I would dislike if I knew her in real life. She just broke up with her boyfriend and is really sad so she cuts all her hair off and dyes it bright pink and cries a lot. The world revolves around her, she doesn’t appreciate her friends… One of her best friends is getting a teacup pig that she’s wanted forever and Addie gets the job of going to pick it up and is warned by the other friend that this is VERY important and she should NOT mess it up. She doesn’t. Instead this psycho old woman finds out Addie has to get the pig – she buys the pig from the pet store, holds it hostage in her apartment, and eventually when Addie tracks the pig down the old lady lectures her on the magic of caring about others and gives her the pig. Addie finds this wonderful. I would have punched that stupid woman in her face. She was no Christmas angel. She just took this girl’s pig to be obnoxious. Stupid old people. Think they know everything. Whatever. In the end, pretty much all the characters from all three stories end up at a Starbucks. Addie gives her friend the pig, Stuart and Jubilee and Tobin and the Duke are there. Jeb, Addie’s not-so-ex-after-all-boyfriend shows up after having a hard time originally in Maureen’s story. When Lauren is writing the story, Maureen and John’s characters fall extremely flat. Lauren’s characters were already flat. Clearly I’m ridiculously biased and love Maureen and John anyway, but really – their writing and characters are far superior. Overall though – this book is hilarious, heartwarming and satisfying. Especially when it’s actually snowing and you can curl up some hot tea to read it. But it’s also really good now or anytime. It’s always a good time for Maureen’s weirdness and John’s smarts. This is definitely one of those books that just makes me happy to read. A Waffle House full of cheerleaders is awesome, if armed with gasoline and matches. So, a girl does something with a small pig, eh? Does this end like Aberforth and his goat?